The right pastel surfaces will make your art shine. Pastels, more than any other medium, are greatly affected by the surface on which you apply them, so I have found that it is vital to understand these effects. Pastel is a light powdery medium, so whatever surface you use with them must have 'tooth' (an ability to grip the dry pigment). Color accumulates around the "teeth" and this accentuates the texture of the paper, board, or canvas. Understand this, and you will be able to choose which pastel surfaces are best for your art. If you are just starting, I recommend using one of the following pastel papers. They are reasonably priced and easy to use. Canson Mi-Teintes paper--This is my favorite pastel paper. If I don't have the time to make my own paper, and I don't want to spend the money on expensive specialty types, this is what I normally use. Canson is French-made and the standard size is 19x25 inches (48x64 cm). It has decent tooth, and has texture on both sides, although one side is smoother than the other. I personally prefer the smooth side because the texture is not too obvious, but still holds the pastel particles well. Keep in mind, however, that Canson paper will not take too much rubbing or scraping. Also, it will not allow you to add layer upon layer indefinitely. Fabriano Ingres paper--Like Canson paper, these reasonably priced papers come in many colors and have different textures on each side. The rough side of this paper is more useful to me than the rough side of the Canson paper. The standard weight is lighter than Canson, but Fabriano sells a heavyweight paper as well. 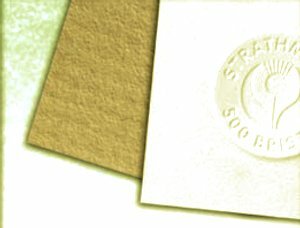 Strathmore papers--There are two types of Strathmore paper; Strathmore 500 is the more popular. This American-made paper is more fragile than either the Canson or Fabriano papers. Strathmore paper is ideal for lightly applied drawings with pastel pencils. Sanded pastel papers--I really love sanded pastel papers. They are perfect for pastel artwork, because they will hold a large amount of pastel chalk--particularly with fine grade sanded paper. Extra-fine grade paper can feel so smooth that it doesn't seem like sanded paper at all. I recommend using fine grade for most pastel techniques. If you have never used sanded paper before, I really recommend it. You can do amazing things with it. For example, I have ruthlessly scratched off old paintings from fine grade sanded paper, painted a completely different work on it, and the tooth did not seem to be affected. It was a remarkable experience! Sanded paper comes in larger sizes than the other pastel papers I have listed. Unfortunately, they are also more expensive. However, you can make your own sanded paper at home to save money and, that also gives you the option of using different grits on the surface. Etching papers and watercolor papers--My students and I have successfully used both types of paper; they are great for larger pastel works. I often use Arches etching papers--cold pressed and rough sheets. Watercolor papers are very strong, have a lot of tooth, and they have beautiful texture. Both watercolor and etching papers can withstand a lot of wear and tear. Handmade papers--More and more handmade paper is showing up on the market these days. As you might expect, each one is different, so you will have to experiment with them to find the right texture, weight, and color for you. There are several other products that make good pastel surfaces which will sometimes see in art supply stores. Velour paper, for example, is great for soft pastels. Although it does not show details well, you can use velour paper to achieve a soft and blurry look. 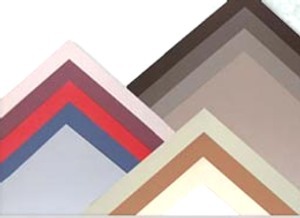 Canson also produces pastel boards which take more wear and tear than its pastel paper. The drawbacks are that they comes in only one size and the range of colors is fairly limited. You may also spot a “pastel cloth” made by Sennelier. This is an unwoven synthetic fabric that can hold a lot of pastel pigment. It is very sturdy and is sold by the yard. You use it like you would canvas (for oil painting), and cut it to the size you want. Make sure you tape the edges when you work on it since it tends to warp. I hope this quick overview of common pastel surfaces will encourage you to try something new. A different surface can be a great way to enhance your drawings or paintings. Whichever type you choose, I recommend that you use the best quality pastel surfaces you can afford.